Counter-protesters dance on H Street Northwest outside of Lafayette Park during the Unite the Right rally on Aug. 12, 2018, in Washington, D.C. It seemed like the “alt-right” got the memo that spewing hateful rhetoric and inciting violence like we saw last year in Charlottesville, Va., only further marginalizes them. The few neo-Nazis, white nationalists and sympathizers who were present at the Unite the Right 2 March were completely dwarfed and drowned out by thousands of counter-protesters. Black Lives Matter DC and BYP100 showed up and organized over 4,000 people to remind the country that although there is a white supremacist in office, the voices of the people will be heard. They said 400 people full of hate rhetoric would be in D.C. and yet only 25 of them showed up. This is because our work is working. Last year, we witnessed a white supremacist march into Charlottesville that created violence and death. Counter-protestors stood up boldly against mostly white men who were hell-bent on creating a type of chaos reminiscent of the early 1930s and ’40s during the height of lynch mobs. After the protest, Heather Heyer was dead and a city and nation whirled with trauma. A few weeks later, white supremacist protesters decided to show up in Boston with another Unite the Right rally. This time our movement was prepared and with the leadership of Black Lives Matter Boston, Cambridge and a fierce activist, Monica Cannon, they mobilized thousands of folks to show up and counter-protest against a laughably tiny rally of white supremacists. 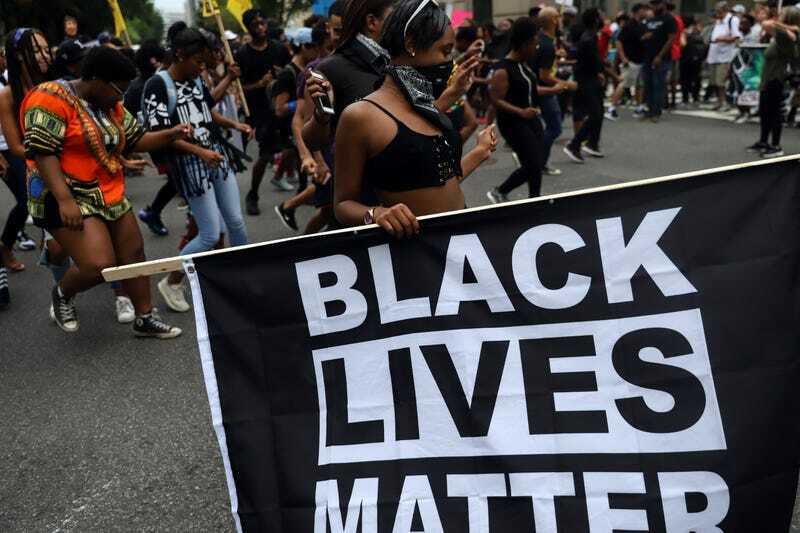 We are living under some of the most frightening times and yet organizations like Black Lives Matter and BYP100—both parts of the Movement for Black Lives—are not just organizing counter-protests against white supremacists, but are on the front lines of changing the way we understand democracy. We march, we vote, we challenge and confront this nation’s underbelly and we are winning. They said 400 people full of hate rhetoric would be in D.C. and yet only 25 of them showed up. This is because our work is working. Our movements are developing a sophisticated response to the cowardice of white supremacists who are unable to mobilize their own base to a rally they called for. Sunday was a victory. It was incredible to see black people: queer, cis, trans, nongender conforming, disabled, immigrants, and our allies all standing up to white supremacy, and experiencing love and joy together. It was beautiful. We are here to get down to business and to send the clear message that we will always stand up for equality and black lives while having fun. BLM rallies are full of song and dance, allies, affirmation and pride. We were here not only to confront white supremacy but to promote black liberation and center black joy. Patrisse Khan-Cullors is an artist, organizer and freedom fighter living and working in Los Angeles. Co-founder of Black Lives Matter, and founder of Dignity and Power Now, she is also a performance artist, a Fulbright scholar, a popular public speaker and an NAACP History Maker. Patrisse is currently a 2019 MFA candidate at the University of Southern California. Follow her on Twitter.